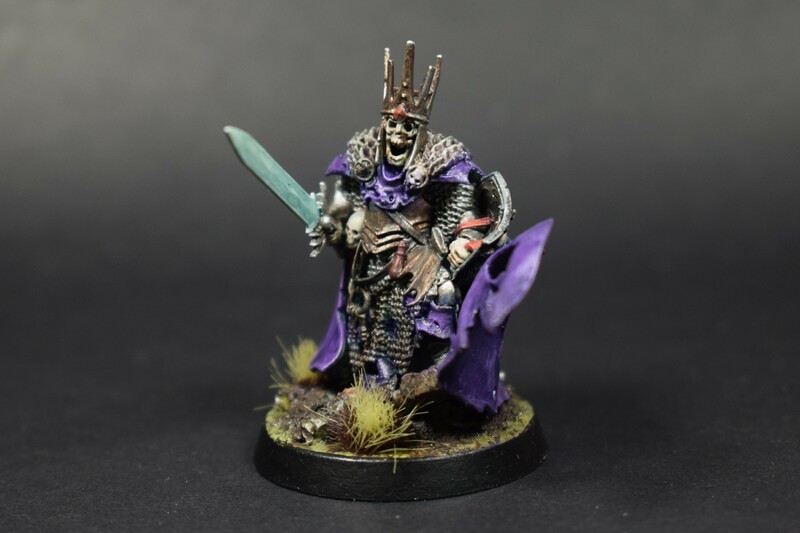 Finished my first Death characters last week! Initially, I’d gone for an Incubi Darkness base for the main non-armour colour, but felt it didn’t give the models enough impact, so switched over to a richer purple. The Wight King’s sword (the side visible in the photo) could also use a bit more shading. I’ve also been trying to work on a bit of narrative for these characters, themed around the events in Lord of Undeath. What was Arhla could not be sure if it had lingered for mere moments or thousands of years. True thought and reflection were not possible, but it remembered resentment, betrayal, terror and duty. The responsibility, it could recall, was the rebuilding of the Jackal Gate of Nulahmia. Its wretched presence it could feel, still, looming above – drenched with foul sorcery, and petrified souls. Subject to this twisted melody, Arhla could not disobey the sonorous force preventing his escape from the dank chamber in which he had been interred – for he had refused Neferata’s will. 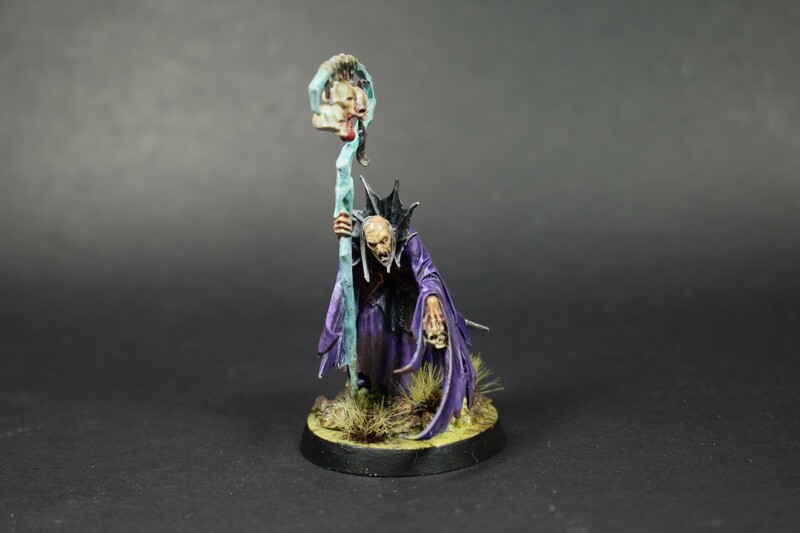 All had been called upon by Lord Harkdron to raise the deathly hosts of the city, even those recently granted the title ‘Necromancer’. As commanded, Saskial had twisted and arced his arcane power into the subterranean vaults beneath the Jackal Gate. But he had been interrupted by the presence of a childhood friend, a whisper of something he had once felt. The reanimation had been a success, but the interruption had cost him dearly. Failure to dominate Arhla and those he had been buried with had left intact a dangerous trace of will and purpose. Feeling them flee the city into the swirling mist and fetid swamps of the Mirefells, Saskial began his pursuit, knowing everything depended on regaining control. Liking the purple. Catches the eye. The purple is very effective. Looking very sharp.